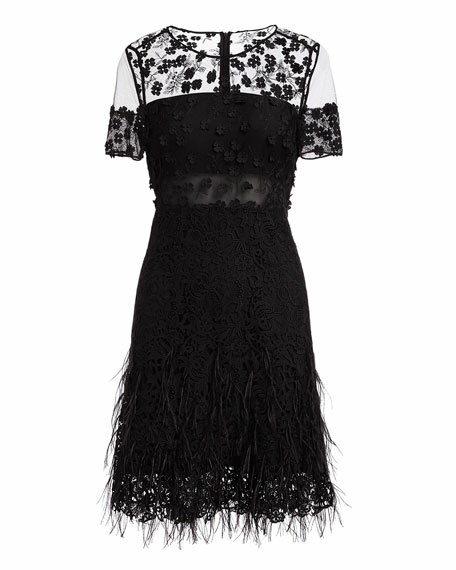 Elie Tahari "Anabelle" fringe dress. Round neckline; floral lace yoke. For in-store inquiries, use sku #2460766. Exclusively ours. 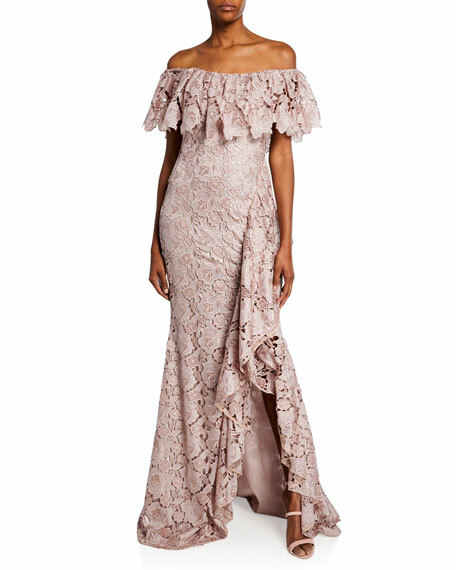 Badgley Mischka Collection floral lace gown featuring a cascading side ruffle detail. Off-the-shoulder neckline. Short sleeves. 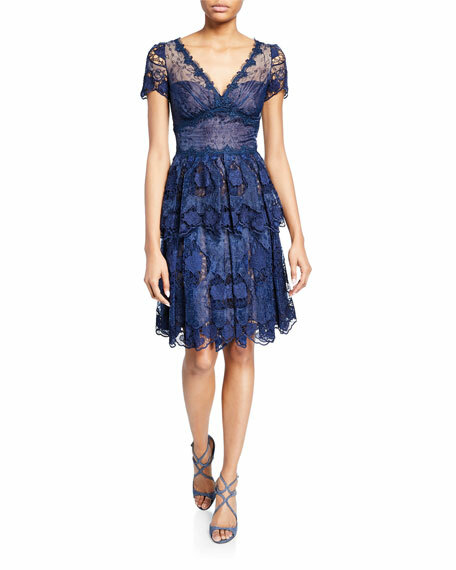 Lace popover bodice. Slit at front left. Mermaid silhouette. Floor-length hem. Train at back. Hidden back zip. Polyester, self/lining. Imported. Exclusively ours. 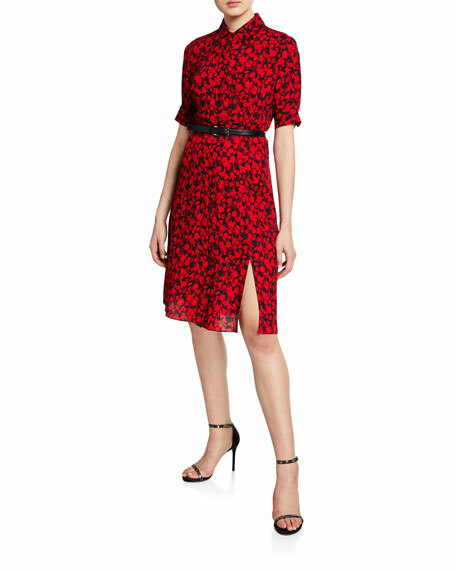 Elie Tahari "Aisha" floral-print dress. Spread collar; hidden button front. Short sleeves; button cuffs. Belted waist. A-line silhouette. Knee-length. Thigh slit at left. Straight hem. Polyester. Dry clean. Imported. 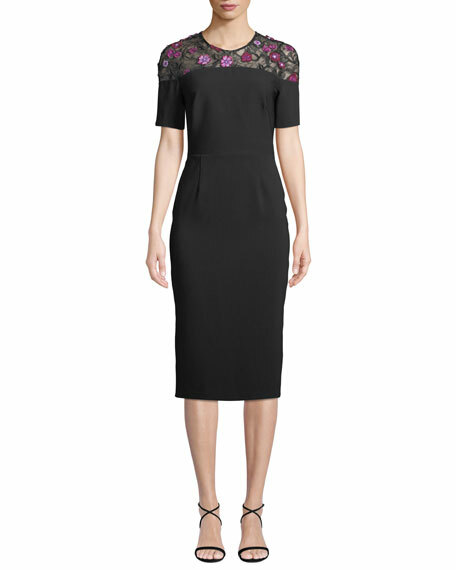 Lela Rose crepe cocktail dress. Floral-embroidered lace yoke. Jewel neckline. Short sleeves. Sheath silhouette. Hidden back zip. Knee-length. Polyester/cotton/viscose/nylon. Lining, polyester. Made in USA of Italian materials. 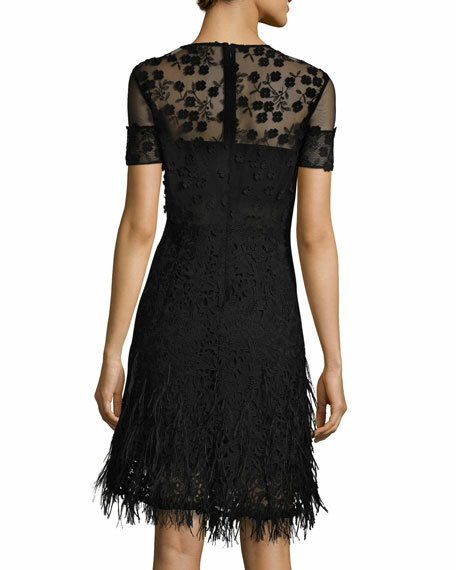 Marchesa Notte tiered cocktail dress in floral eyelet organza with scalloped guipure lace trim. V-neckline; sweetheart illusion; keyhole back. Short sleeves. Fit-and-flare silhouette. Knee-length. Scalloped hem. Hidden back zip. Polyester. Imported.